GolfCaddy 1.0 is designed to provide quick distances measurements in real time from your current location. This app may also be used to provide more complex measurements such as waypoints or targets. Markers can be set and dragged by clicking on the screen to desired location. Markers can be quickly set and stored to mark the best shots which can be used as a target or reference for future games. Quick zooming to current location for distances measurements. Can be used to measure distances to target waypoints (such as pin) from anywhere. GolfCaddy can also be used to measure distances of hits such as drives and putts. Q: What is the ME button? A: The ME button is a multifunction button that is primarily used to display the Options menu and to control where the ME marker is placed. The ME marker (red) is the reference marker that is used to calculate the distances to all the other markers and will also show the current location if the ME button is pressed or FollowMe is turned on. The distance from ME marker to each of the 4 colored markers will be shown in the status bar matched according to color in the desired units. The ME marker can be arbitrarily placed anywhere in the world if FollowMe is turned off. If no button is selected then the ME marker can be placed anywhere on the map by pressing a location. Press on the map again and another marker will be used to find the distance between two points. Both markers can be removed by clicking on the ME marker. If the ME marker is not set then press the ME button to goto the current location. This can be helpful during a game to quickly move the map to the current location and get distances to each marker. Q: How do you add markers to a golf course? A: GolfCaddy 1.0 was designed to setup the course in two ways. One can setup a golf course by going to the Options->More Options->Goto->Address and entering in the address of any golf course. GolfCaddy will move the camera to that location. Then the markers can be placed by clicking on the screen for each hole. Remember to save the markers after setting them for each hole. Repeat this procedure if desired for all 18 holes per course. The second way to setup the markers for a course is by physically going to the course and press & hold the M1-M4 buttons as you reach each location per hole. Once the first marker is set select Options->Save Markers and give a name for this round of golf (ie black squirrel 5-6-16 ). After the first marker is saved each subsequent marker that is dropped by pressing & holding M1-M4 will automatically be saved per hole. Remember to select the appropriate hole (1-18) before dropping a marker. Typically M1 should be used to mark the Tee, M2 used to mark the first shot, M3 the second, M4 to mark the pin location but this sequence is not mandatory. The distances will be calculated, however, based on the location of a lower number to larger number. For example if M1, M3, M4 are set the the distances will be calculated from M1 to M3 and M3 to M4. The status bar will always show the distances to the ME marker whenever the ME marker is set. Using the press & hold method to set a marker will automatically save each marker if a course is selected. Q: How do you set a marker at the current location? 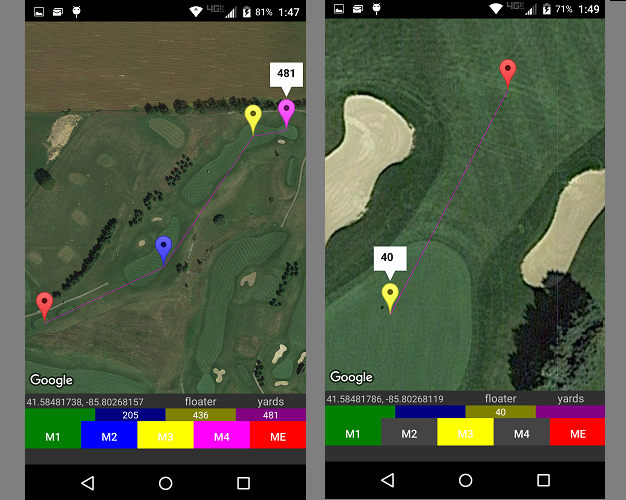 A: GolfCaddy 1.0 is designed to provide up to 4 markers per hole per course. The 4 colored markers can be used as targets, waypoints or best shots. Then during a game one can quickly determine how far from the target each shot was. In other words if you make a better shot than the target marker simply press & hold the M1-M4 button to place or move a marker to the current location. This can be used to mark your best shots which can be used as a target in future games. Q: How can I get a quick distance measurement from current location to pin? A: With GolfCaddy 1.0 this is not a problem. There is a quick and simple way to get the distance between two points. Ensure that no buttons are selected and the ME marker is cleared then press the ME button which will place the ME marker at the current location. Then press anywhere on the screen to place another floater marker and show the distance between these two points. subsequently press on the screen to get distances to any location. If a marker is already set for the pin then simply press the ME button and the distance to the pin will be shown in the status bar. Another way to quickly get the distance is to select one of the marker buttons M1-M4 (preferably M3 or M4) and if this marker is already set remove it and relocate to the desired pin location and the distance to ME will be shown in the status bar. Q: Why doesn't the ME marker always show the correct location? A: At times you may notice that the ME marker does not set at the correct location when the ME button is pressed. The reason for this is because when the app is activated or launched it can take up to a few seconds to get a GPS lock on the device. If you notice that the marker is not at the correct location just remove the marker, wait a few seconds and press the ME button again. It should be a rule of thumb to wait a few seconds after the app is activated or launched before dropping a marker at the current location. Q: How do you measure the distance of a drive? A: There are a couple of ways that the distance of hits can be measured. The most effective way is to select [Distance] from the list of hole selections. This will put GolfCaddy into "Measure" mode which will permit the measurement of distances on any hole. Then remove the M1-M4 and ME markers from the screen (do not press the Clear Markers button). Press the ME button to move the camera to your current location. Then press & hold M1-M4 to drop a marker at the current location. Walk or drive to the location of the ball and press & hold the next marker M2-M4. The distance will be shown on the screen. The ME marker could also be used for the second point and the distance will be shown in the status bar according to color. The reason the ME marker should not be used for the first marker is because the ME marker is never saved but the M1-M4 markers are saved if they are dropped by the press & hold method. The reason the Clear Markers button should not be pressed is because this will clear the markers but will also clear the selected course and you will need to reselect the course to continue where you left off. If you are not using a selected course then there is no problem selecting the Clear Markers button.